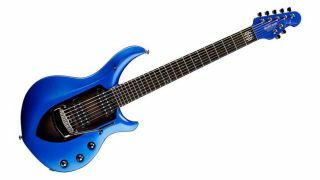 Musician's Friend has announced a positively mouthwatering deal on the Ernie Ball Music Man John Petrucci Majesty Seven-String guitar. From now until November 25, you can save $599 on the seven-string version of the Dream Theater axeman's signature model. That means, you can get it for $2,199, rather than the usual asking price of $2,799. The guitar features a piezo system for acoustic tones, in addition to push/push volume boost and custom tone configurations for the two DiMarzio humbuckers. The aforementioned discount though, is only available for the guitar's Siberian Sapphire finish. The model's Iced Crimson ($2,299), Goldmine ($2,399), Polar Noir ($2,499) and Arctic Dream ($3,099) finishes will set you back a bit more.